I know this recipe doesn’t sound that exciting, but it tastes so good that I just had to put it up! Chives are by far my favourite herb, I would happily heap them on top of every single meal I have for the rest of my life. And they go SO well with eggs. So yum for a simple breakfast that only takes 10 minutes to make. Cut crossaints open, but not in half. Lightly toast in the grill. Combine eggs and cream in a bowl and lightly beat. Pour into non-stick pan and cook for 3 minutes or until fluffy. Remove from heat, add chives and stir to combine. 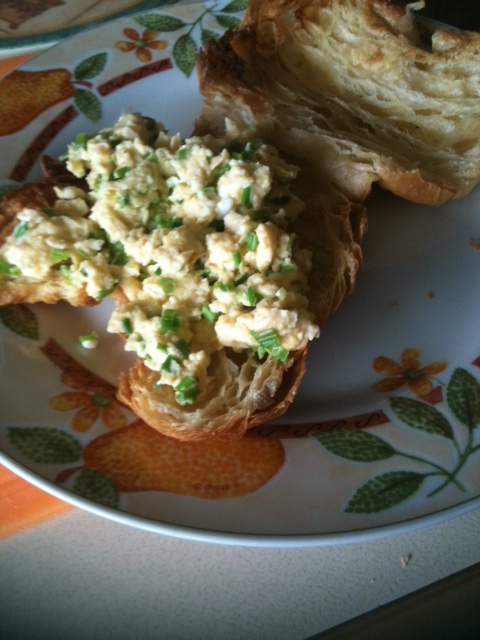 Spoon eggs onto crossaints, sprinkle with pepper, and serve. Yummmmmmmmmmmmmmmmmm! Serves 4. Stay tuned for a big post tomorrow!